At the age of 20, Kofi Annan left Africa for the first time. The youngster from sunny West Africa was bound for one of the coldest parts of the United States: St. Paul, Minnesota. Annan shows a kente cloth -- a traditional fabric worn by Ghana's kings -- to a classmate at Macalester. Annan's path overseas was set in motion when he attended a meeting of African student leaders in Sierra Leone as the vice-president of the Ghana Students' Union. At the time, the strapping, athletic Kofi Annan was studying economics at the University of Science and Technology in Kumasi, Ghana. Spotted by a Ford Foundation talent scout at the Sierra Leone conference, Annan soon had a full scholarship to Macalester College, a small, liberal arts college in St. Paul. In Annan's first winter at Macalester the Secretary-General recalls that he learned a lesson that would stay with him throughout his years at the UN: "Never walk into an environment and assume that you understand it better than the people who live there." Newly arrived in St. Paul, Annan had quickly grown accustomed to wearing winter clothes, but had refused to wear earmuffs because of their ungainly appearance. After his ears nearly froze during a brisk winter walk, though, he quickly revised his thinking -- and learned a valuable lesson: Annan promptly bought the biggest earmuffs he could find. 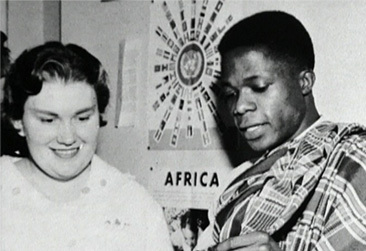 In 1961, with an economics degree in hand from Macalester, Annan, set his sights on working at a new Pillsbury mill in Ghana. When the company's plans fell through, Annan headed instead to Geneva, Switzerland where he undertook post-graduate studies in international affairs at the Institut Universitaire des Hautes Etudes Internationales. It would prove to be a pivotal move. In 1962, Annan joined the UN system as a budget officer with the World Health Organization (WHO), on the P1 level, the lowest professional designation within the international civil service. Annan spent three years with WHO before moving on to the Economic Commission for Africa in Addis Ababa, Ethiopia to focus on development projects. From Addis Ababa he went back to the U.S. to obtain his masters in management from the Massachusetts Institute of Technology. In 1974, he returned to Ghana as Director of the Ghana Tourist Development Company. Ghana, at this time was politically unstable -- with military coups one after another. According to Annan, "I wanted to make a contribution to Ghana but I found himself constantly fighting the military, so I went back to the UN." Kofi Annan, who was also a track star at the University of Science and Technology in Kumasi and at Mfantsipim School, was a member of the track team that won first in a Minnesota championship race in 1960. While at Macalester, Annan was also a state champion orator and president of the Cosmopolitan Club, a group that promoted friendship between U.S. and international students. Left Ghana to study in the U.S. Received his BA in economics from Macalester College in St. Paul, Minnesota. Undertook post-graduate studies in Geneva, Switzerland. Joined the UN system as a budget officer with WHO. Earned a masters degree in management from MIT. Headed the Ghana Tourist Development Company.